LogicaCMG’s forward movement appears to have its after-burners on full but sadly thrusting in reverse! Far more interestingly, Lockheed Martin is up nine places following a fabulous September which included a government win (which according to Lockheed is worth $120 million but could be worth $1.6 billion), an increased dividend of five cents and finalising a deal to take over the RFID vendor Savi Technology. Lockheed appears to be gaining momentum as a service provider and it is also communicating this fact much better. That said, it should also be noted that Savi Technology had an excellent analyst relations programme itself. Whilst better known as an aviation company, Lockheed is now one of the leading services providers in North America and has rightly shot up to number 31 in the rankings. Orange Business Services (formerly Equant) has also been impressive rising seven spots, but this is still due to Equant retaining its branding in the market place. Siemens Business Services has fallen six positions. Verio, Dimension Data and Keane are also down. 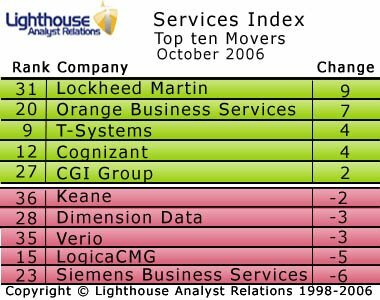 If you’d like to be sent the top 25 of the Lighthouse Services Index each month, please send an email to analysts [at] lighthousear.com.